Brandon Cobb's 18-05 stringer put some breathing room between him and 2nd-place Micah Frazier. 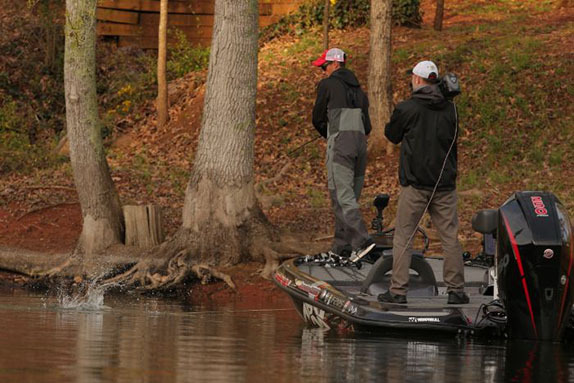 Brandon Cobb is making the one-hour drive back and forth from his home in Greenwood, S.C. each day for the Lake Hartwell Bassmaster Elite Series. He said he'd have no trouble falling asleep in his own bed Saturday night on the verge of his first top-level victory. 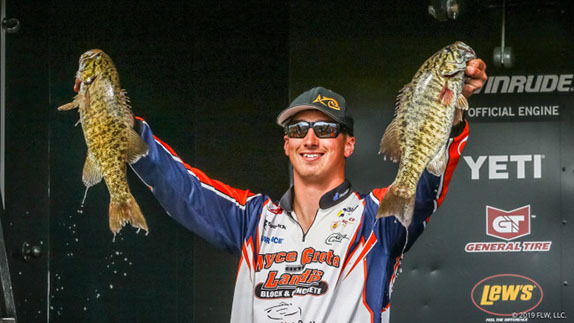 "I'm so tired that no, I won't," he said after weighing an 18-05 stringer on day 3, pushing his total total for the event to 55-06 and extending his lead over 2nd-place Micah Frazier to more than 5 1/2 pounds. "I've been getting worn out. Going home every night has been nice, but shooting to get (to the Green Pond Landing launch ramp in Anderson) at 6 o'clock every morning has been pretty rough." 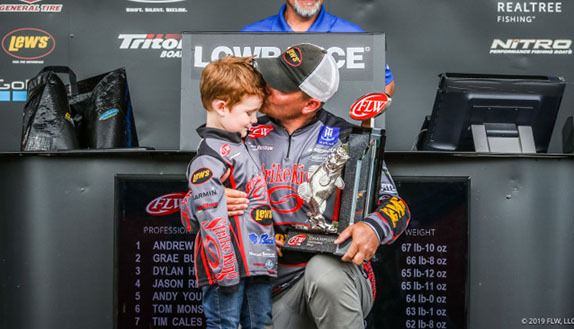 If a blue trophy with a leaping bass on top accompanies him on Sunday's return trip, he'll have logged a wire-to-wire victory on his home lake. A bag anywhere close to the 18 1/2 pounds he's averaged thus far will almost certainly do it. Frazier stayed in the No. 2 position where he began the day, but his deficit grew considerably after he registered his lightest bag of the event � 14 pounds � which gave him a 49-12 total. Stetson Blaylock jumped from 10th to 3rd with 49-10 after a strong 19-03 haul and standout rookie Drew Cook slipped from 4th to 3rd with 49-07 after boxing 14-13. Bill Lowen also dropped on spot to 5th with a 14-14 stringer for a 49-01 aggregate. Shane Lehew led the second half of the top 10 as a day-best 19-08 bag catapulted him from 22nd to 6th with 47-08. He was followed by Jamie Hartman with 46-06 (16-04 on day 3), Hank Cherry with 46-03 (14-11), Chad Pipkens with 45-14 (16-01) and Mark Menendez (45-10). 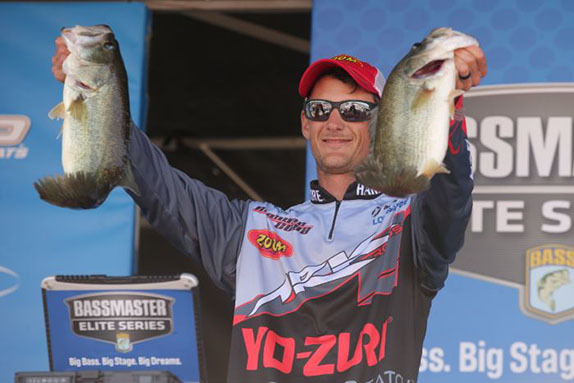 Cobb tangled with � and boated � a pair of 4 1/2-pounders on day 3. Lehew, Hartman, Pipkens (who's a bit handicapped this week while recovering from a broken clavicle suffered in a hockey game last month) and Menendez were the newcomers to the top 10. They supplanted Brandon Lester (6th to 16th with 12-10 on day 3), Jeff Gustafson (7th to 13th, 13-04), Matt Arey (8th to 29th, 10-01) and Patrick Walters (9th to 11th, 14-12). Sight-fishing dominated the day and will do so again in the final round. A few showers might make looking a little more difficult in the morning, but even a steady rain on day 2 couldn't hide the active spawners in Hartwell's clear water. Cobb, whose best pro finishes were 3rd-place showings in the 2015 and 2017 FLW Cups, said his day transpired in similar fashion to the previous round. His stringer was headed up by a pair of 4 1/2-pounders. "For me, at least, it's been pretty easy to catch 2- to 2-something-pound fish, but the bigger ones, the 3-pluses, aren't real easy," he said. Today I spent a lot of time looking because a 2 3/4-pounder might've helped me, but a 2 1/2 wouldn't. A couple of times I even pulled them to the surface without catching them to get a better look because it wasn't too hard to catch them again if I needed to. "I think there's plenty of fish around to catch 11 to 14 pounds without a big one. To be 100-percent safe, I think I'll need 14 1/2 to 15 pounds tomorrow. I could be okay with 12 1/2 to 13, but I wouldn't be saying, 'Okay, I've got this.' It's not just one guy I have to stay ahead of � there's four with dang near the same weight." Frazier didn't encounter the type of quality he did the previous day, when he weighed 18-03. None of the fish in his bag exceeded 3 1/2 pounds. "I had some solid ones, but I didn't catch a big one," he said. "I'll just have to keep moving tomorrow and hope I run into some better fish. I'm not going to spend very long fishing for 2 1/2 pounders unless I know they're going to bite very quickly. Stetson Blaylock gained seven places in the standings with his day-best 19-03 bag. "I saw some bigger ones, but they wouldn't act right. I might make a pass through there tomorrow but I don't think it's going to be any different � they're sketchy because the water's falling." 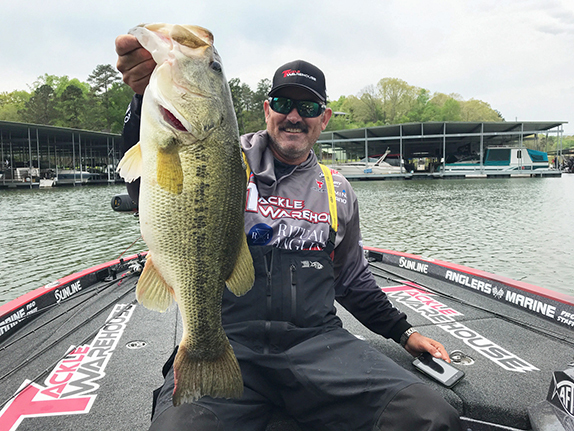 Blaylock had a solid morning, and then his day went from good to excellent around noon when he caught a fish that was just an ounce shy of 6 pounds and another that was over 4 in quick succession. "After I had those two big ones I thought I could catch over 20 pounds, but I really struggled to do anything after that," he said. "I don't know why that was � the water was warming and there should've been more fish moving, but it was like a ghost town. I'm not sure what was going on, but at least I survived for another day. "I saw some other great big fish that didn't want to play and I think it was because of the pressure. It was unbelievable how many boats were out there fishing just for fun. They caught some, of course, but they had their boats right on top of all of them." His biggest fish came from a foot of water. He thinks he can make a run at Cobb if he finds several similar specimens on the final day. "If you pull into the right pocket, you can catch 22 or 23 pounds in a hurry." 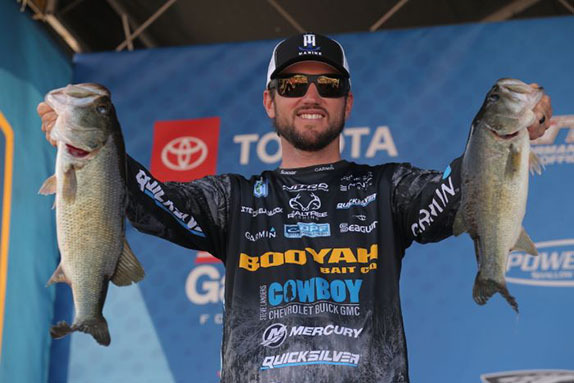 Cook, who's battling Cobb for the lead in the Angler of the Year race (they were separated by a single point after day 3), said he found some big fish late in the day that he didn't have time to work on. He estimated the largest at 7 pounds and the other two at 5 and 4. Naturally, he'll go straight to them to start day 4 and hopes to find them in a more accommodating mood. "I probably could've caught all of them if I'd had another 30 minutes," he said. "It was just one of those things � it was a pocket that I hadn't been to since the first day of practice and I just went in there too late. "That 7-pounder could change the game real quick." > Day 3 stats � 35 anglers, 35 limits.